This book will make you laugh out loud. It will also make you weep. Lost & Found will warm your heart. It might even restore your faith in humanity. Does that all sound like a very tall order for a book? Perhaps you think I'm exaggerating the adorable delight that is Lost & Found? I'm not. Go read it and see for yourself. 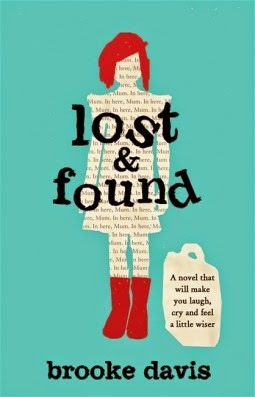 My friend Monika, at A Lovely Bookshelf on the Wall, published a wonderful review about Lost & Found here. Check it out! Awwww! I love that you loved this one. And now I want to love it, too. Nope. No exaggeration. Just a fantastic book! You read it, Lindsey? Hooray! I'm glad you liked this one. I had the worst trouble getting into it and ended up with a big DNF, but it sounded so quirky and delightful that I was sure I was gonna love it. You aren't the only one to say this. I wonder if this is going to be one of those love it or hate it books? ;) I'm sorry you didn't like it! I love the gifs, Jennifer! This novel is on my to-read list. Thanks :D These little posts are always fun to put together. I hope you love this book, it was great! This looks like such a great book!! Need to add to my TBR! Yes, you really do ;) I'm a total book pusher, lol. Such a great idea! I love GIFs :) And this books sounds really cute - I've been seeing it around a lot lately. I used to do these fairly often and I'm going to start again :D Regular reviews aren't really working for me anymore. It's a really cute book. Quirky and adorable! How have I not heard about this one yet?! It's been a little quieter than I expected. I hope it finds its way into your hands, Lisa! i was sitting on the fence about this one. No longer. Great review - you've convinced me. Thank YOU for making me pick this one up. I almost totally skipped it. Ack! That cover! I'd read it for the cover alone, it's that stinkin' cute.